This is it then, pole position has been decided for the final race of the season. 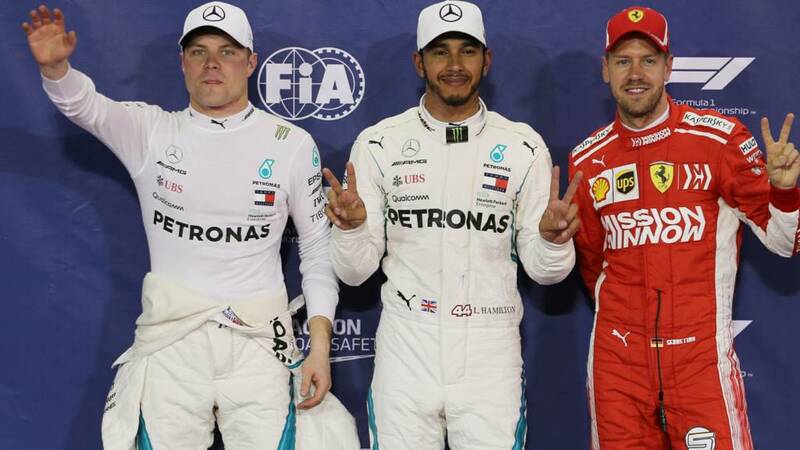 All that's left tomorrow is some fun to be had, and some the small matter of some points to decide who finishes where in the drivers' and constructors' championships. We will be back from 11:30 GMT for the race tomorrow, and Jack, Jolyon and Jennie will be back on air on BBC Radio 5 live at 13:00 GMT. Tomorrow will mark Fernando Alonso's final day in Formula 1, before he drives off into the sunset in search of the final piece of motorsport's triple crown... the Indy 500. "My precious"Image caption: "My precious"
His first world title confirmed a race before in Brazil, Alonso had nothing to prove in this race but there was no post-championship drop in form or desire. Starting 16th on the grid after rain in what was then a one-by-one qualifying format, he passed the Ferrari of Michael Schumacher around the outside of the infamous 130R corner. Delayed by having to return a place to Red Bull’s Christian Klien and then re-pass the Austrian, he finished third, overshadowed by Kimi Raikkonen’s brilliant last-lap pass of Alonso’s Renault team-mate Giancarlo Fisichella for victory. Thomas Perrett: Sometimes I think losing the 2016 title to Rosberg was the best thing to happen to Hamilton, since then he just hit another level, that I'm not sure we would have seen. Ritch: Eddie Jordan says he thinks Lewis Hamilton can't keep up his performances for much longer. He needs his head looking at. Hamilton is capable of smashing the record of 7 titles. Jeremiah: Mercedes have a way of outdoing the other teams. First they give them hope. Then from nowhere they go for hammers! Real fast laps. Kayleigh: So Hamilton should purposely stall it tomorrow arvy and give Bottas the win. Lord knows the poor guy deserves a win! Yes you read that right... Alonso did say he might come back to F1. Fernando Alonso speaking to Sky Sports in his colourful race suit. He says: "We’ve been very competitive this weekend and were pessimistic for Q1 with out chances and we somehow managed to go to Q2 and that’s good. "My priories are to finish the race to see the chequered flag. If we can be in the points that will be in the dream, we are five places away now. Speaking on his future he says: "I needed a break and I need to find something else to do, but I'm open after that maybe I do another F1 season, or somewhere else." Sebastian Vettel, who starts third on the grid tomorrow says: "I enjoyed the session. Obviously in Q1 it was very tight, then in Q2 Lewis put in a great performance in those ultrasoft tyres and I thought it was going to be tough. "In Q3 we did improve but we just weren't quite there. Tomorrow will be a long race, and it will be fun. "Obviously it didn't go my way and Lewis enjoyed it a little more, but I'm looking forward to getting in the car tomorrow for the last time this season and giving it a real go. "I don’t see the reasons why you can't talk with each other or joke with each other, I enjoyed it and it didn’t go my way. I'm looking forward to it as the last race and to give it everything we have." Valtteri Viktor Bottas, who starts second on the grid tomorrow says: "For sure I was aiming for pole, I had a good result here last year, but I couldn't repeat that. "Personally P2 wasn't what I was expecting but good for us even though we have secured the championships we can still be one-two for the final race. "I was performing well but I couldn't beat his time, he did a great job." Lewis Hamilton, pole sitter for the final race of the year, says: "I'm so grateful for all the support we've had here. It's so emotional for me because it's the last lap I'll do in this car. I've been so emotionally attached to this car. "I'm so grateful for the mechanics who put this together for me. To just go all out and put a performance like that is a special feeling. I'm just happy that this car will be in the history museum at Mercedes in Germany, so I can go visit whenever I can. "It's been a privilege to work in this team with the mechanics who have given it to me. Their diligence I'm so grateful for everyone and its so much fun to go out there and express yourself and push your car the way you want. I never say there is a perfect lap the first one wasn't spectacular there was excursions and movement at the rear end the last sector was the killer and were I was able to make the difference, that'snot easy to do. "Valtteri did a great job and Sebastian too." A really impressive performance for Hamilton with Bottas just behind him. How they'd love to wrap the season up with a one-two, they haven't done that since Japan. Reece Young: The lap @LewisHamilton did on the ultrasoft tyres was half a second quicker than what anyone else managed on the HyperSoft tyres. Damn that is a Stormer of a lap. Stunning. Simply stunning. Very well deserved pole position for @LewisHamilton. Faultless qualifying session. He never ever takes his foot off. What a season it's been. Matt Naturist: Enjoy your 5th position Daniel... I fear you'll not see it again for a while! Rachel T: We’ve been saying it ALL SEASON, but WHAT A LAP from @LewisHamilton - Championships both done and dusted but he isn’t done yet! 83 POLES!!!!! Lewis Hamilton is on pole in Abu Dhabi, and it's another Mercedes front-row lockout. No pole for Bottas, he comes over the line 0.162 secs slower than Hamilton in second. Looks like it could be a front-row lockout for Mercedes. They've (Ferrari's) got plenty of time but they can't afford to mess around too much with their out lap.